Robbie is a Sydney based Functional Dietitian and Sports Nutritionist who graduated with a Bachelor of Exercise Science and Nutrition and a Masters in Nutrition and Dietetics. 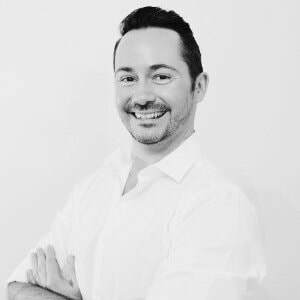 He currently works as a practitioner in private practice in an integrative health clinic in Sydney's Northern Beaches and in Darlinghurst. Robbie is the Co-Founder, Director and Dietitian at HealthBank, a complete cloud-based practice management and telehealth software system that is licensed to Allied Health professionals (Naturopaths, Dietitians, Nutritionists, Psychologists, Exercise Physiologists), which allows them to conduct secure video or audio consultations with their patients. The platform also allows practitioners to monitor their patients’ health, diet, treatment programs and lifestyle through the HealthBank online portal. Robbie developed HealthBank so he could expand his practice online and increase his reach across Australia. He treats clients both face-to-face and online. Robbie also works as a corporate health consultant , where he is responsible for assessing and reporting on the health of individuals within the workplace. With his energy and long-standing passion for food it has empowered Robbie to help people embrace the benefits of food through education as he strives to improve the health and wellbeing of individuals both in the workplace, sporting clubs and the wider community. Robbie has extensive experience across a variety of clinical, corporate health, community health and health promotion areas. He is highly personable and professional and enjoys all aspects of nutrition, and is particularly passionate about men’s health and sports nutrition as well as having a keen interest in diabetes, weight management, cardiovascular disease and gastrointestinal disorders. He enjoys consulting individual clients, assisting them to reach and maintain their goals. To further his interest in the effect of food on sports performance, Robbie completed a Sports Nutrition Course at the Australian Institute of Sport and he now provides strategic eating advice to both adult and junior athletes at a recreational level as well as elite and professional level, for training and competition. I believe wholeheartedly in balance and a "everything in moderation" approach. "Diet" is a word that you won't hear me say too often, which is ironic considering I am a Dietitian. However, Diets are usually overly complicated and make it unrealistic for most people to follow them. One may get fantastic results from a diet, but keeping the results is often unsustainable. That's why I want to help educate people to get back to basics and with my help, you can expect: a healthy metabolism, more energy and vitality, more muscle, less fat, improved hormone balance and, more importantly, a different mindset when it comes to food and eating. My approach in achieving and maintaining optimal health is focused more on just food and nutrition, the remaining pillars of a healthy lifestyle include: stress management, exercise and moving your body, hormone balance, quality sleep, work-life-balance, and healthy and positive relationships with others. The number one challenge or obstacle I see in my clients is consistency, whether it be around food choices, exercise or stress management. I believe consistency and accountability is the key in achieving your health goals and is an area that I work very hard on with my clients. "Success is the sum of small efforts - repeated day in and day out." As a business owner, I understand the challenges that come with a busy lifestyle, but I would like to think that I practice what I preach every day. Helping people cut through the hustle and bustle of life by educating and providing tips around thoughtful food choices and preparation methods that fit into their busy schedules is key. My mission is to help people get back to basics and make eating simple and healthy by providing clear, approachable nutrition education and recipes that are easy, convenient, time-saving and most importantly suit the needs and desires of people's lifestyle. Also, my goal is to help decipher and dispel the nutrition myths that are filling the heads of all Australian's by the media and provide sound, evidence-based nutrition and health advice to all.